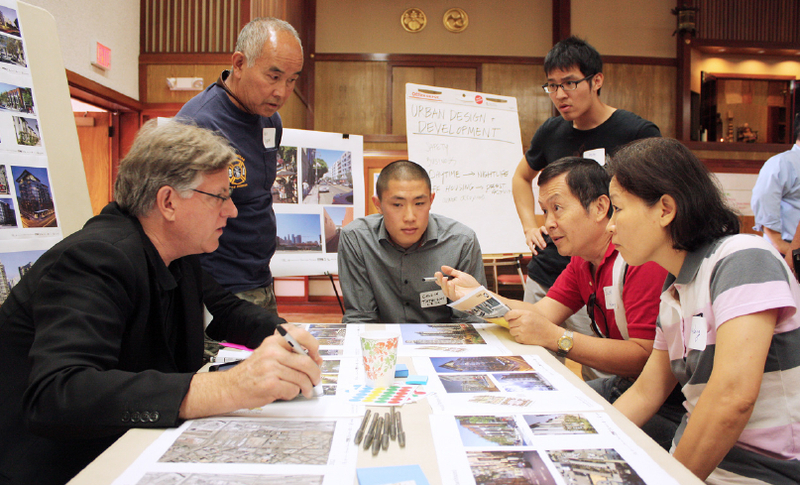 More than 150 people participated in Sustainable Little Tokyo, a three-day series of meetings with experts in design, transit, economics, and green technology aimed at creating a comprehensive vision for Little Tokyo as construction begins on the Regional Connector. “This is a perfect time for the community to make its voice heard loud and clear about the vision we have for the future of Little Tokyo,” said Thomas Yee, director of planning at the Little Tokyo Service Center. Topics addressed at the forum included community identity and culture, mobility and linkages, urban design, green infrastructure, Leadership in Energy & Environmental Design (LEED), and market and economic analysis. At a Sept. 27 opening meeting, held at Koyasan Buddhist Temple, a timeline showing key events in Little Tokyo history was spread out along one wall and participants were asked to indicate when they first started coming to the neighborhood. The workshops were held with an eye towards the future impacts of the Regional Connector, a 1.9-mile underground light-rail system that will connect the Blue, Expo, Red and Purple lines. When completed, the Little Tokyo Regional Connector transit station will be among the busiest in L.A. County. Yee said that having a comprehensive vision for the area around the transit station will be vital for Little Tokyo. Little Tokyo residents, seniors, business owners and nonprofit organizations were among the participants in the interactive workshops. Yee noted that officials from Metro, the mayor’s office, Council District 14, Department of Water and Power, and various city agencies also attended the meetings. Sustainable Little Tokyo was sponsored by the Little Tokyo Community Council, Natural Resources Defense Council, Enterprise Community Partners Inc., Local Initiatives Support Corporation Los Angeles, Mithun, Mike Okamoto & Associates Inc., Puttman Infrastructure Inc., Keyser Marston Associates, and Estolano LeSar Perez Advisors LLC. A final set of recommendations will be drafted based upon the input received during the workshops. Yee said that document would be shared with government agencies as well as private developers prior to any new construction around the Regional Connector. “That way they’ll know our neighborhood has a plan and a vision which we’re really committed to and that the future development of the site around the station should start with this vision,” Yee explained. For more information on Sustainable Little Tokyo, visit www.littletokyola.org.